regarded American animator David Hand, with backing from J Arthur Rank. for animated stardom, and several licensing deals were struck in his name. celebratory film "Ginger Nutt's Christmas Circus". toons might well have stepped straight off a Disney sketchpad. but the hero just lacked that certain winning sparkle. In the end, GB-Cartoons folded within three short years of its launch. of the very best cartoons this country has produced..
whilst Nick eventually invited us in to Doyley Woods. writing pool. Bob also voiced several of the Animaland critters. actually turned down as a GB-Cartoons trainee! comic strips, puzzles and games starring all of the Animaland gang. 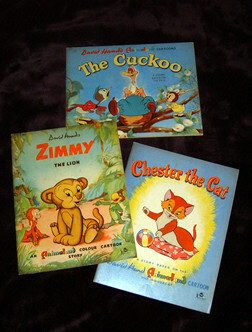 This fantastic trio was also published by Juvenile Books of London. Oswald Ostrich and Digger Platypus ever make it into print? Well, let's just hope they did because these books are simply fabulous. Each retells the relevant character's cartoon story with glorious illustrations. Dinkum Platypus. designed by arthur gredington. Here are the nine toons, with synopses and credits. only revealed off-screen, in the tie-in books and publications. Oh, and one thing you really won't find here are voice credits. After All" is accompanied by stark and outlandish cuckoo caricatures. In Darkest Africa a Naturalist ponders the myth of the lion. cub, but this toon exposes him a far-less appetizing man-eater! with their halos, driving him away and winning the fight for our hero! who are now tormented by their own chittering offspring! of those classic Harman & Ising cartoons of the same era. helps paper over a painfully thin plot. 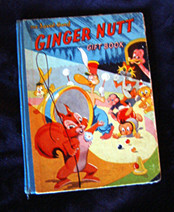 Ginger Nutt receieves a letter from Hazel, arranging a rendezvous. river. Only, his pals Corny, Loopy and Dusty are in eager pursuit. and many are named for the first time as they perform in the circus. Ginger Nutt will do anything to protect his sweetheart Hazel. But his oath is overhead by his pals, and they put it to the test. has now come for a reinvention....?